"Blue Bird" & Sunbeam land speed record cars of the 1920s. Homepage. This page: Two comics from 1927, one featuring Malcolm Campbell's Blue Bird, the other Henry Segrave's 1000hp Sunbeam. Land Speed Record cars feature from 1927. The battle to be the fastest man on earth really captured the public's imagination in the 1920s and 1930s. Many childrens' books and comics featured these dare-devil motorists, as they vied with each other for the honour of capturing the land speed record for themselves, and their country. In the 1920s, there were a number of Brits actively building cars to try and be the fastest of all. One comic that chose to sing the praises of these heroic endeavours was The Nelson Lee Library. There are several copies featured on this page, one depicting Captain Malcolm Campbell's Blue Bird, the other two Henry Segrave's 1000hp Sunbeam LSR car. This follows on from another copy of the Nelson Lee comic on the site, which covers the story of J.G. Parry-Thomas, and the Babs land speed record car, again published in 1927 as part of this set. As with the comic featuring Babs, both of these issues originally came with a metal model of the car featured on that comic's cover. Sadly they've long since disappeared, but if anyone turns up a simple model of Babs, Blue Bird or the Sunbeam, assembled by folding a metal sheet into the shape of these cars, please get in touch. Now, a quick look at each of these issues. Sir Henry Segrave's 1000hp Sunbeam record car. Unless some miracle happens, the 1000 horse-power British Sunbeam car with which Major H.O.D. Segrave made history is likely for a very long time to retain the proud title of "the world's wonder car". Designed to reach a speed of 200 miles an hour, it actually reached 207, beating the then world's speed record by 35 miles an hour! This has well been called quicker-than-thought motoring, for thought itself is a slow-coach compared with that Sunbeam performance. A famous scientist has pointed out the real meaning of this comparison by means of the following illustration. Supposing you decide to pick up a pencil from desk or table. Between the thought and the action there is a difference in time of rather less than half a second. In that fraction of time Major Segrave's Sunbeam covered forty-seven yards! So that any mechanical movement which he wished to make during that nightmare drive was certain to be about fifty yards late each time, which means that he had to think about fifty yards ahead! But it was impossible, at that terrific speed, for Major Segrave to see anything closer than six hundred feet ahead. The top of this monster Sunbeam is only 3 feet 10 inches above the ground, and the ground clearance is only seven inches. The wheel-base measures 11 feet 9 inches, and the track 5 feet 2 inches. The car's queer shape is designed to cut out wind resistance as far as possible. It is equipped with two 500 horse-power engines, each having twelve cylinders. One engine is at the rear end, the other at the front. The front engine is started up first. It is equipped with a metal bottle containing compressed air, which, as it is released, turns the forward engine over, which automatically starts the rear engine when the clutch is let in. Then the two engines run smoothly together, their running speeds being evened up by means of their engine revolution indicators on the dashboard. That dashboard is an amazing affair, for on it there are twenty eight instruments - six oil pressure gauges, nine magneto switches, three radiator thermometers, four engine revolution counters, four camshaft oil pressure gauges, and two air compression gauges. In addition there are three clutches to operate! Four Gallons of Petrol a Minute! The front engine radiator is in the "nose" of the chassis, the rear engine radiator behind the air cowls at the rear of the driver's cockpit, with a twenty eight gallon petrol tank at the rear of all - an allowance of four gallons per minute! The tyres, of the finest possible manufacture, would not last out for more than about a mile if this Sunbeam racer were driven on an ordinary concrete road. A sand surface is more kindly - hence one of the reasons for the selection of Daytona Beach. Another reason, of course, was the wonderfully straight run the beach afforded. This was very necessary, for two miles were needed to work up maximum speed, a hundred miles per hour being reached within a few seconds of starting up the engines! The three speed gears give speeds of 90, 150 and 220 miles an hour respectively, and after the brakes are applied it takes four miles in which to come to a stop. Not the least of the great dangers which Major Segrave so coolly faced with this car was the tremendous wind force naturally attendant on a speed of 207 miles an hour. At that rate the wind, if it hit the driver, would knock him unconscious - hence the provision of a steel windscoop (an ordinary screen could not possibly stand the strain) to fling the roaring wind safely over the driver's head. That record-breaking spin was the monster Sunbeam's last run, except for a short "exhibition" sprint on Brooklands track. Having done her duty, this 57 hundredweight car went back into the Sunbeam works, at Wolverhampton, where it was made, for mechanics and scientists to learn the lessons of the almost incredible strains placed on every square inch of its make-up. In the event, however, of this car's speed record being broken, it is the opinion of her designers that, with certain modifications and further tuning, her speed could be considerably increased. The monster Sunbeam may yet be seen, therefore, entering the lists, with Major Segrave again driving to retain the speed record of the world for Old England. Segrave would go on to vye for the land speed record in later years, taking his new car, Golden Arrow, to a maximum of 231.446mph, again at Daytona. The water speed record was another target that he aimed for, and sadly would be his undoing. He and his co-pilot died whilst attempting a Record run in Miss England II on Lake Windermere. The date? Friday, June 13, 1930. Another comic featuring the Sunbeam land-speed-record car. Some time after this page first went live, what should turn up but a copy of the previous week's magazine, ie that for November 19th 1927. The cover of this issue again features Segrave's Sunbeam record car, illustrated from a much lower angle this time. Placed throughout the comic, amongst a number of thrilling adventure stories and ripping good yarns, are reminders of the free metal model that would come with the next issue. If I could lay my hands on one of these metal models I'd be very pleased. Did they just do the three models, ie the Sunbeam, Blue Bird, and Babs, or were there others too? Malcolm Campbell's Blue Bird car. The next issue of Nelson Lee, for December 3rd 1927, turns the spotlight onto probably the best known name in the history of land speed record attempts - Campbell, in this case Malcolm Campbell, and his Blue Bird (later Bluebird) LSR activities. Out for the World's Records. The world's land speed record will be seriously challenged before very long, when Captain Malcolm Campbell's three-ton racing car, the Blue Bird, gets going on Daytona Beach USA. 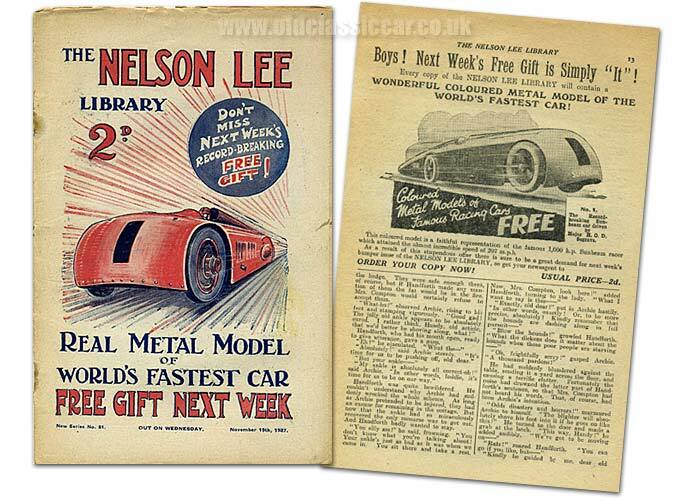 The present holder of the world's record - Major Segrave, a model of whose giant Sunbeam car was given away with last week's NELSON LEE LIBRARY - whizzed over that same stretch of sand at the terrifying speed of 207 miles per hour. That speed was maintained only for a short distance, however, the official record for the Sunbeam's complete "run" being just over 203 miles per hour. That is the figure which the Blue Bird, with Malcolm Campbell at the wheel, has been designed to beat. Captain Campbell has already done wonders with his mighty machine, two of its achievements being the breaking of the world's flying mile and kilometre records, on the sands at Pendine, in Wales, last February. Nearly Three Miles a Minute! Then the Blue Bird was out to reach the speed of three miles a minute. It all but managed it, just falling short of the 180 miles per hour by three-fifths of a second! Valuable lessons have been learned from the performances of the late Parry Thomas' Babs (a model of which will be given away with next week's NELSON LEE) and the great Sunbeam. And with these in Major Campbell's mind, it may be that the Blue Bird will put up a very wonderful show against that 203 miles per hour record. This car, which is to fight the next great duel with Father Time - otherwise the clock - is fitted with a 450 horse-power twelve cylinder Napier-Lion aero engine, similar to the one which helped the tiny Supermarine Napier seaplane, piloted by Flight-Lieut. Webster, to capture the most coveted air prize in the world - the Schneider Trophy - at 280 miles per hour in September last. Though rated at 450 horse power, the Blue Bird's engine may yet, under favourable conditions, be able to develop another fifty, making a total of 500 horse power. Whether the Blue Bird succeeds or fails in its great objective, the attempt will be yet another tribute to Britain's sterling worth in men and materials. Captain Malcolm Campbell is British, of course. And so is the Blue Bird, right through - from the Vickers steel of which it is largely built, to its British Thomson-Houston magnetos, its Claudel Hobson carburettors, and its Dunlop racing tyres on Rudge-Whitworth wheels; the body itself was made by Jarvis' of Wimbledon. The Blue Bird has all of this in its favour - and it will have more when put to the tremendous test on Daytona Beach. That long run-way of smooth and level sand is almost ideal in every way, while the Pendine Sands "track", on which the Blue Bird's best-yet run has been made, is not. At Pendine there is the big double handicap of a limited length for getting up speed, with only a very narrow margin at the end of the run in which to slow down. These obstacles do not exist at Daytona Beach. When Malcolm Campbell was breaking records at Pendine, the course had first to be partly drained by means of sand ploughing. And spectators who arrived there in cars realised something of the difficulties to be faced there by racing cars when their own machines began to settle down and sink in the sodden sand. Keen wits soon found a remedy for that unpleasantness, however. The car owners locked their front wheels right over and let their machines slowly circle round on their own, in bottom gear, thus defeating the dumb challenge of the sands to stand still and be swallowed! The beach at Daytona provides the longest straight course and the fastest natural track in the world. 500 feet wide at low tide, as level and smooth as a billiards-table top, the fine sand is hard-packed enough for boys to roller-skate on it - very different from the Pendine Sands, from which the sharp shells have to be picked up and carted away in lorry loads to prevent the tyres of racing cars being torn to shreds. Whatever the Blue Bird does on those better sands in the USA, it will without doubt translate into practical terms the proud motto of British racing motorists and car and engine designers and manufacturers - "We'll Show the World!". 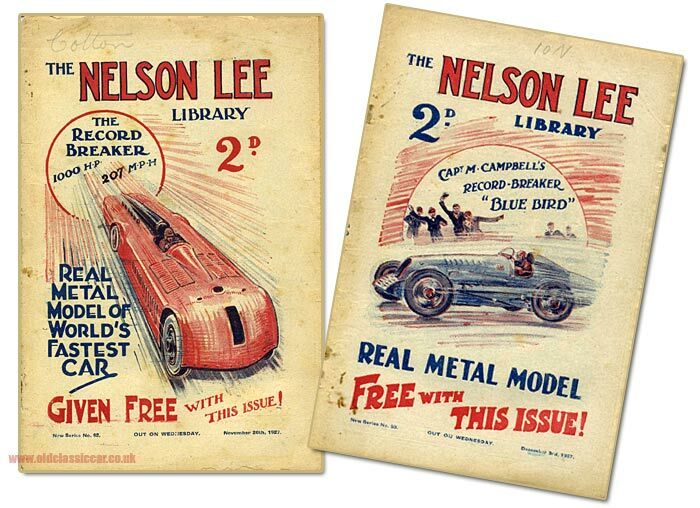 So in all, I've evidence of three British land speed records car being featured in copies of the Nelson Lee Library (Segrave's Sunbeam, Campbell's Blue Bird, and Parry-Thomas' Babs) - did any others make it onto the cover of this comic-book I wonder?? Return to the car collectables section, or read about other racing items here.